Japan Tourism Agency (JTA) announced that the sales of the 49 major Japanese travel agents amounted to 488.5 billion JPY in August 2018, 3.3% more than a year earlier. The monthly total consisted of 194.3 billion JPY for the outbound travel business (+10.2%), 23.9 billion JPY for the inbound travel business (+10.4%) and 280.3 billion JPY for the domestic travel business (-1.6%). The graphs below show the outbound travel business results of the top five travel agents (12 JTB group companies, six H.I.S. group companies, three Hankyu Travel group companies, 13 KNT-CT group companies, NTA). 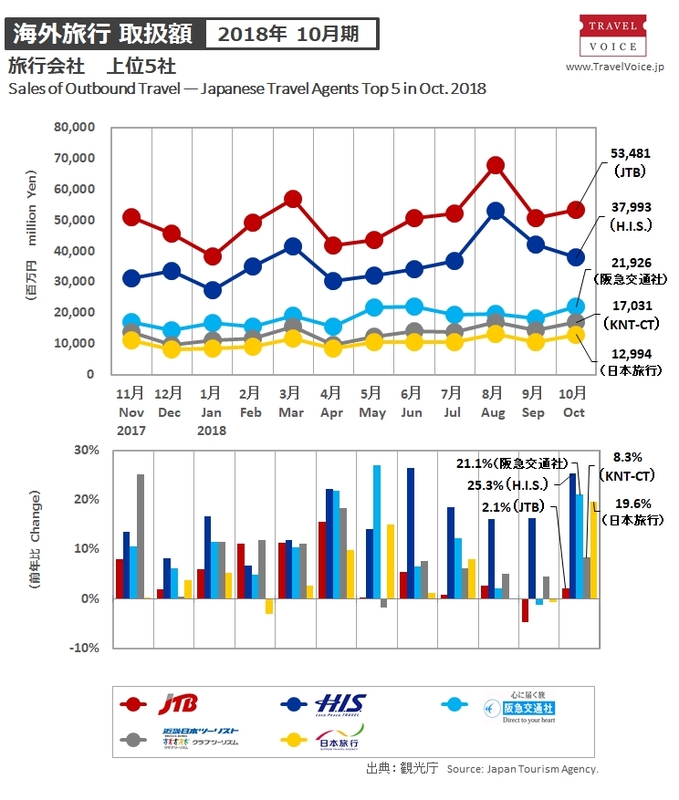 Among them, H.I.S., Hankyu and NTA enjoyed double-digit growths, and JTB also improved from a monthly reduction in September to a monthly increase in October. The graphs below show the inbound travel business results of the top five travel agents (12 JTB group companies, six H.I.S. group companies, NTA, 13 KNT-CT group companies, Tobu Top Tours) for the past year. H.I.S. and NTA have competed each other for the 2nd for the last three months, and Tobu saw a 28% increase. *Since June 2018, Rakuten has not disclosed the business result of Rakuten Travel. 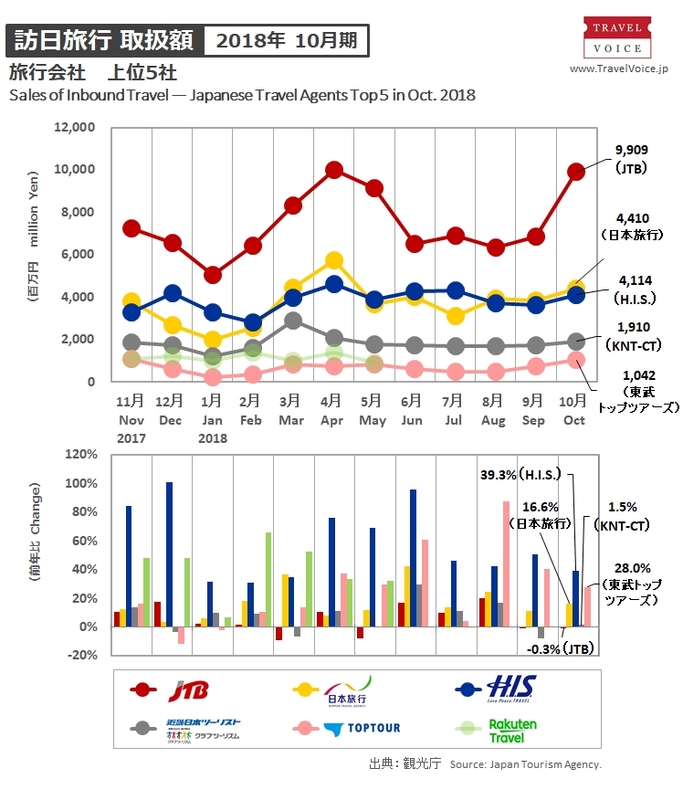 The graphs below show the domestic travel business results of the top five travel agents (12 JTB group companies, 13 KNT-CT group companies, NTA, ANA Sales and Hankyu) for the past year. Hankyu overtook ANA Sales to be the fourth. 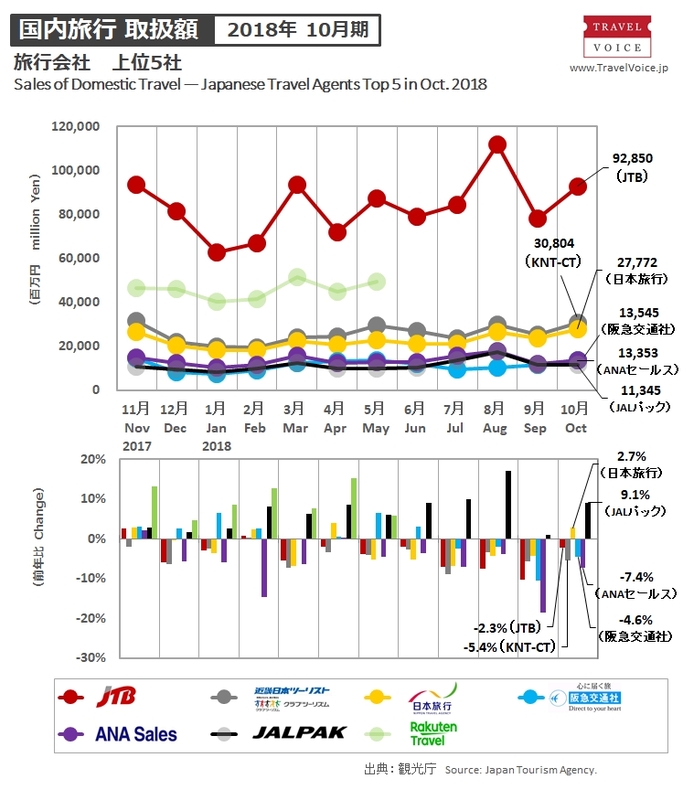 The sales of package tour brand products totaled 121.2 billion JPY (-3.0%) with 2,971,871 customers (-5.6%) in October 2018. The breakdown was 37.3 billion JPY (-1.0%) with 156,737 customers (-9.1%) for the outbound travel business, 662 million JPY (+4.9%) with 42,205 customers (-4.3%) for the inbound travel business and 83.2 billion JPY (-4.0%) with 2,772,929 customers (-5.7%) for the domestic travel business. 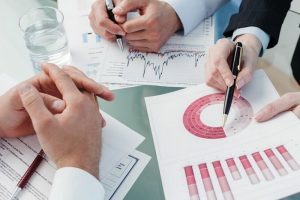 According to the market trends based on hearings from travel companies, sales for South Korea especially increased in the outbound travel market. The inbound travel business was no longer affected by the natural disasters occurred in September. In the domestic travel market, sales for Hokkaido and Western Japan still reduced year on year, while sales of group travel increased.